An aesthetic way of welcoming guests, a tea ceremony is one in which everything is done according to an established order. The tea ceremony comprises the host bringing the tea utensils into the room, offering the guests sweets, and then preparing and serving them tea. The tea is made of pulverized tea leaf in hot water. Though the tea ceremony is traditionally best enjoyed by wearing kimono or yukata, this ceremony allows travellers to join the activity in non-formal or casual clothes. Many may not be comfortable changing clothes in an unknown environment. If you are one of them, you can still enjoy the fascinating cultural ritual of tea ceremony in Osaka. You will make a green tea or matcha in a tea ceremony room designed with ancient aesthetics in mind. You will be shown some unique figures, statues and small landmarks while you are in the premises. The ceremony is led by a tea master. The cultural history behind the tea ceremony is explained by the instructor. Through the entire activity, opportunities for clicking photographs will be highlighted. If you are with children, it will be an enjoyable experience for them as well. The activity takes place at the Golden Pavillion section or the Edo-fashioned room of Maikoya Osaka, which is a popular tourist and entertainment hub in the popular Shinsaibashi shopping area, Osaka. So, once the workshop is over, you can participate in other workshops and activities at Maikoya Osaka or relax at the relaxing Maiko Café. Kimono Tea Ceremony Maikoya is an authentic cultural experience within a 6-storey structure, which was a geisha house till the mid-1980s. Here, you can participate in the tea ceremony wearing a kimono. Some of the best kimonos are available for you to choose. Additionally, a wide array of antique calligraphy tools and historical artefacts are on display. The ceremony is conducted by a maiko or geisha, which will contribute to a unique experience. The instructors will explain to you the symbolism, meaning and subtle aesthetics of the ritual. The tea ceremony is performed in the same way as the natives did about 400 years ago and care is taken to create the same ambiance. All your queries and questions will be answered enthusiastically. Cake and tea are offered. It is held at the Maikoya Osaka, which is an easily accessible location. The tea ceremony and kimono-wearing experience can be experienced in Tea Ceremony in a Kimono in Osaka. Here, you will get to learn the ritual of making green tea from a Japanese tea master. Additionally, you’ll get the chance to drink premium green tea and consume Japanese sweets while gleaning about the local culture. It is a hands-on cultural experience for first-time visitors, which gives them a sound insight. It is a great tea ceremony and kimono-wearing experience in Osaka. You can learn about local culture from a tea master and witness a tea ceremony. Wearing a traditional Japanese kimono allows you to get close and personal to the Japanese ethos. This particular tea ceremony is the best one as it is neither too simplistic as the Japanese tea ceremony in Osaka (casual clothes) nor too elaborate with the involvement of a geisha as in the Kimono Tea Ceremony Maikoya Osaka. Here, you get the feel of Japanese culture without being overwhelmed by it. Cultural activities and workshops are an excellent way to get an insight into the rich history, values and holistic way of life in Japan. By learning about Japan and its people from such a close and intimate perspective, you will be immersed in the different lifestyles and approaches that are singular to this country. Interaction through local instructors and guides gives you the best opportunities to understand this culture. Learning a traditional, beautiful new activity from a fluent English-speaking tutor in a creative setting is the ideal way to delve into a new ethos. 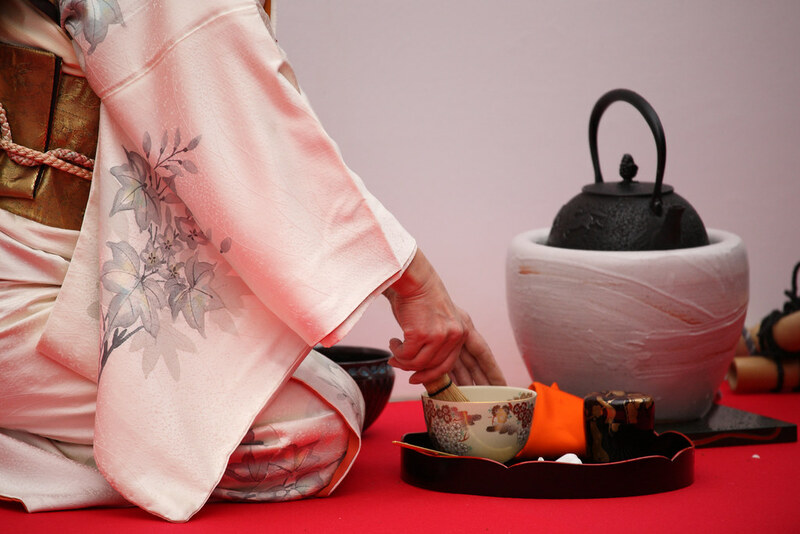 Experiencing a tea ceremony will help you explore Japan in all its splendour.